One of the poorest and most violent countries in the Middle East, Yemen is also an area of strategic importance for regional players – and some of the world’s most dangerous terror groups. RT explains the underlying reasons behind the nation's conflicts. The territory that lies within Yemen’s borders is one of the most ancient cradles of civilization in the Middle East, once known as ‘Arabia Felix’ – Latin for “happy” or “fortunate” – in ancient times. The lands of Yemen were more fertile than most on the Arabian Peninsula, as they received more rain due to high mountains. But because of declining natural resources, including oil, Yemen and its population of about 26 million are now very poor. Still, the country boasts a strategic location on the southwestern tip of Arabia. It is located along the major sea route from Europe to Asia, near some of the busiest Red Sea shipping and trading lanes. Millions of barrels of oil pass through these waters daily in both directions, to the Mediterranean through the Suez Canal and from the oil refineries in Saudi Arabia to the energy-hungry Asian markets. The Yemeni transport hub of Aden was one of the world's busiest ports in the 20th century. Although the history of the lands of Yemen date back thousands of years, modern Yemen itself is a young nation, with its current borders having taken shape in 1990, after North and South Yemen united. Before that, both parts were involved in conflicts of their own. Northern Yemen was established as a republic in 1970, after years of civil war between royalists and republicans, with the first supported by Saudi Arabia and the latter by Egypt. Yemen’s former president, Ali Abdullah Saleh, rose to power through the military and held power for decades. Although Southern Yemen agreed to merge with Saleh’s northern republic in 1990, they soon became unhappy about the move. The north and south became embroiled in a new civil war, resulting in thousands of casualties, while Saleh’s power prevailed. Outside big Yemeni cities, there are a number of tribal areas that are effectively self-governing. With a large number of civilians being in possession of arms – it is believed there are more guns in the country than citizens – local tribal militias often repress the national army and apply their own laws, based on traditions rather than the state’s constitution. 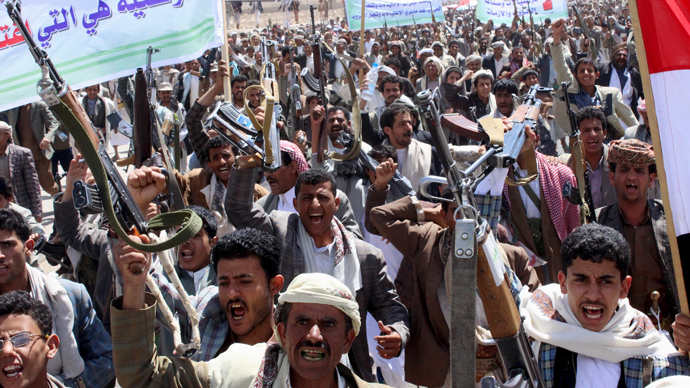 Houthis have risen to be one of the most powerful militias in Yemen. The majority of Yemen’s population is Muslim, but it is split between various branches of Islam – mainly Sunni or Zaidi Shia. The divisions between the Sunnis and the Shia are based on a long-running religious conflict that started as a dispute about the Prophet Mohammed’s successor. While Shia Muslims believe the prophet’s cousin should have filled the role, Sunnis support the picking of Muhammad’s close friend and advisor, Abu Bakr, as the first caliph of the Islamic nation. That said, Zaidi Shias – making up about 40 percent of Yemen’s population – are the only Shia Muslim sect that do not share the belief in the infallibility and divine choice of imams, strongly revered as spiritual leaders among Shias. This causes them to align closer to Sunni practices. At the same time, over the past decades, strict and puritanical Salafi and Wahhabi ideas of Sunni Islam – coming from neighboring Saudi Arabia – have become increasingly influential in Yemen. Houthis represent the Zaidi branch of Shiite Islam from the far north of Yemen, adjacent to the Saudi border. The name of the group comes from a leading family of the tribe. Its member – a Zaidi religious leader and former member of the Yemeni parliament, Hussein Badreddin al-Houthi – was accused by the government of masterminding a Houthi rebellion, including violent anti-Israeli and anti-American demonstrations, in 2004. The Yemeni regime ordered a manhunt for al-Houthi, which ended with hundreds of arrests and the death of the Zaidi leader, with dozens of his supporters also killed. Since then, the Houthis have been actively fighting with the central power, demanding greater political influence and accusing the government of allying with mainly Wahhabi Saudi Arabia while neglecting national development and the needs of the traditional Zaidi tribes. While Yemen’s now embattled President Abed Rabbo Mansour Hadi has claimed that Houthis are supported by Hezbollah – the Lebanese Shia militia – some Western officials have alleged that Iran, one of the few Muslim nations of the Shia branch, financially supports Houthis in an effort to control Yemen’s Red Sea coast. This allegation is denied by the Houthis themselves. Since 2009, Yemen has been an operational base of Al-Qaeda militants. After the Yemeni and Saudi branches of Al-Qaeda merged to form Al-Qaeda in the Arabian Peninsula (AQAP), the group became one of the world’s biggest exporters of terrorism, with the US considering it the most dangerous branch of Al-Qaeda. Osama bin Laden’s family lived in southern Yemen before emigrating to Saudi Arabia. Yemen’s fight against AQAP has been largely supported by the United States. Since 2007, the US has supplied more than $500 million in military aid to Yemen through programs managed by the Defense Department and State Department, and conducted controversial drone strikes targeting terrorists in the country. Al-Qaeda’s ideology is based on radical Sunni Islam and thus is hostile to Houthis, who have also been at war with AQAP militants. With several forces fighting in the country – including the official government, Houthis, and AQAP – the Yemeni chaos provided a fertile ground for extremism. Extremist groups affiliated with the Islamic State (IS, formerly ISIS/ISIL) now operate in Yemen, conducting terror acts against both the military and civilians. In the latest March 20 attack, over 100 people were killed and some 250 injured in suicide bomb attacks on mosques in the Yemeni capital Sanaa, with ISIS militants claiming responsibility for the assault.